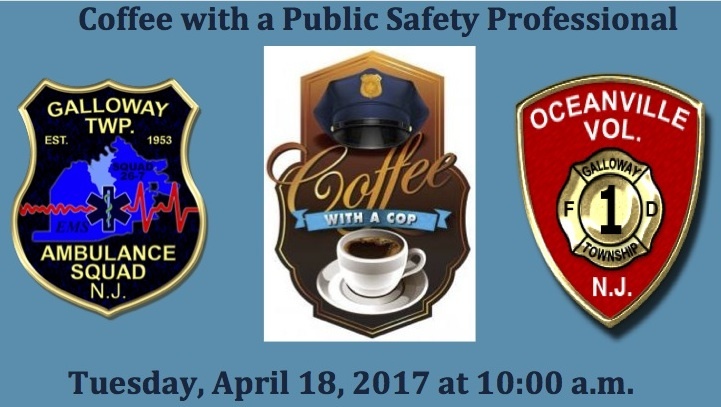 (Galloway Township) – On Tuesday, April 18, 2017 the Galloway Township Police Department, in conjunction with the Oceanville Volunteer Fire Company and the Galloway Township Ambulance Squad will be hosting the first of several “Coffee with a Public Safety Professional” events. This event is being held at the Oceanville Fire Company at 186 S. New York Road in Galloway at 10:00am. Please come out and join us to get to know your local public safety professionals. These events will be held at each Galloway Township Fire Company throughout the summer/fall, so check back for dates/times in your area.